In a follow-up to yesterday's blog post about the "bing sutt" in the Hong Kong Convention and Exhibition Centre in Wan Chai, this morning I arrived early and there wasn't much of a line. Some exhibitors or visitors to Vinexpo, the wine and spirits fair, ordered a western breakfast or wanted an espresso or coffee to take away (which cost extra for a disposable cup). It's interesting they were not keen on trying something different, or they didn't get the concept. I perused the menu and you could order snacks like braised chicken wing with sweet soy sauce (HK$50 for four pieces), or two mini pineapple buns with butter (HK$28), or three mini egg tarts (HK$30). It's a pity those overseas visitors didn't know what those things were to even try them. Or there was no one there to explain what they were, or visuals. 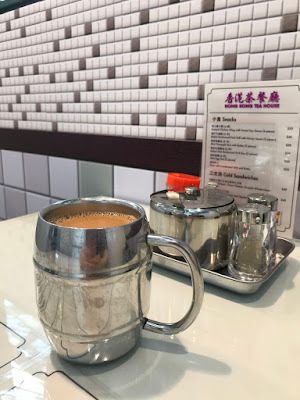 Since I already had breakfast, I had a cup of Hong Kong style milk tea for a whopping HK$30. It's usually less than that, but it's a captive audience here. I had a "booth" to myself and enjoyed the view while drinking the milk tea that wasn't too sweet. The "tiles" on the walls and floor of the "bing sutt" were actually computer print outs, but they looked pretty good from a distance. Other decorations were real, like the wooden birdcage (no birds in it). 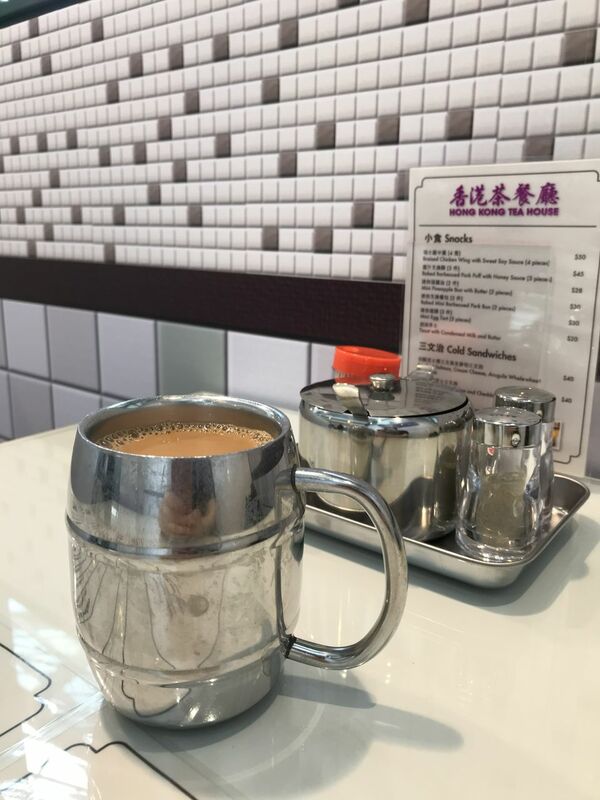 Nevertheless, the caffeine in the milk tea wasn't too strong because after I finished it and walked towards the seminar I was attending, two friends had to wave frantically at me to catch my attention!